Psychological operations (PSYOP) are operations to convey selected information and indicators to audiences to manage perceptions, to influence their emotions, motives, and objective reasoning, and ultimately the behaviours of organizations, groups, and individuals. In June 2015, NSA files published by Glenn Greenwald revealed details of the JTRIG group at British intelligence agency GCHQ covertly manipulating online communities. This is in line with JTRIG’s goal: to “destroy, deny, degrade [and] disrupt” enemies by “discrediting” them, planting misinformation and shutting down their communications. Harvard Law Professor Cass Sunstein, [co-author of “Nudge”], a close political adviser and the White House’s former head of the Office of Information and Regulatory Affairs, wrote a highly controversial paper in 2008 proposing that the US government employ teams of covert agents and pseudo-independent advocates to “cognitively infiltrate” online groups and websites, as well as other activist groups. 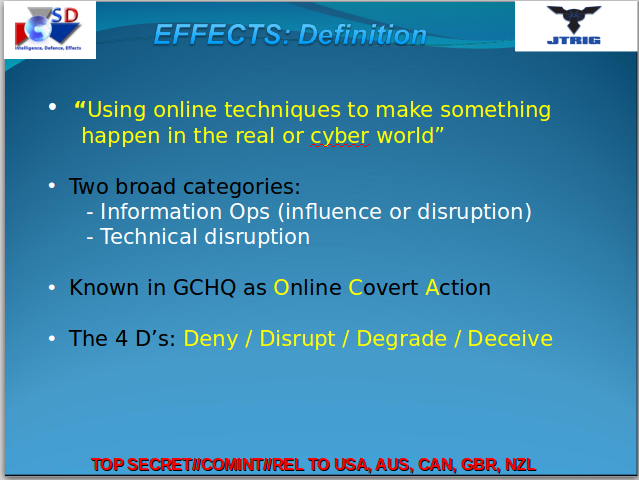 But the GCHQ documents are the first to prove that a major western government is using some of the most controversial techniques to disseminate deception online and harm the reputations of targets. Under the tactics they use, the state is deliberately spreading lies on the internet about whichever individuals it targets, including the use of what GCHQ itself calls “false flag operations” and emails to people’s families and friends. Who would possibly trust a government to exercise these powers at all, let alone do so in secret, with virtually no oversight, and outside of any cognizable legal framework? Now, inevitably, politicians and academics have reacted with fury to news that a covert Government-funded unit has been systematically and strategically attacking the official opposition in Parliament, undermining democracy in the UK. Last month, Anonymous Europe obtained a large number of documents relating to the activities of the ‘Integrity Initiative’ project, which was launched back in autumn, 2015. The project is funded by the British government and is believed to have been established by the Institute for Statecraft. The Institute for Statecraft is affiliated with the NATO HQ Public Diplomacy Division and the Home Office-funded ‘Prevent’ programme, among other things. Statecraft’s Security Economics director, Dr Shima D Keene, collaborated with John A. S. Ardis on a paper about information warfare. Anonymous published the documents, which have unearthed the massive UK-led psyop to create a ‘large-scale information secret service’ in Europe, the US and Canada. The declared goal of the project is to “counteract Russian propaganda” and Moscow’s hybrid warfare (a military strategy that employs political warfare and blends conventional warfare, irregular warfare and cyberwarfare with other influencing methods, such as fake news, diplomacy, lawfare and foreign electoral intervention). The Integrity Initiative consists of representatives of political, military, academic and journalistic communities with the think tank in London at the head of it. The Institute for Statecraft was set up, and is currently led by Chris Donnelly (who, prior to his joining NATO in 1989, was for 20 years at the Royal Military Academy, Sandhurst) and Daniel Lafayeedney (whose military service, legal background and career as an entrepreneur have led him to an “understanding of the importance of the link between business and national security.”) They are supported by a Board of Trustees, Board of Advisers, an Operations Staff, a Strategic Development Team and an extensive network of like minded Fellows, associates and researchers. From the government’s ALLIED JOINT DOCTRINE FOR PSYCHOLOGICAL OPERATIONS WITH UK NATIONAL ELEMENTS, SEPTEMBER 2014 . However, the secret UK Government-funded propaganda unit based in Scotland has also been running a campaign on social media, using posts attacking Jeremy Corbyn and the Labour Party. The Institute for Statecraft appears to be a small charity operating from an old Victorian mill in Fife. But the explosive leaked documents, which have been passed to the Sunday Mail, reveal the organisation’s Integrity Initiative is funded with £2million of Foreign Office cash and run by military intelligence specialists. The Conservative group is supposed to counter Russian online propaganda by forming “clusters” of friendly journalists and “key influencers” throughout Europe who use social media to hit back against disinformation. “The new security environment is increasingly spawning a variety of asymmetric threats which require immediate attention. Many of these threats are driven by the desire for economic gain, either as an end in itself, or to assist in achieving an ultimate end. Efforts to tackle the economic aspects of these threats have frequently been neglected or, at best, fragmented. This is particularly the case in the international sphere, allowing our adversary to operate in a benign environment. “Security Economics is the analysis of the economic aspects of human-induced insecurity, such as terrorism and organised crime. Counter Terrorist Finance/Anti Money laundering (Legislation/Regulation). A further message refers to an “alleged British Corbyn supporter” who “wants to vote for Putin”. It is not just the Labour leader who has been on the receiving end of online attacks. The party’s strategy and communications director, Seumas Milne, was also targeted. “Milne is not a spy – that would be beneath him. The Integrity Initiative has been accused of supporting Ukrainian politicians who oppose Putin – even when they also have suspected far-right links. Further leaked documents appear to show a Twitter campaign that resulted in a Spanish politician believed to be friendly to the Kremlin being denied a job. The organisation’s “Spanish cluster” swung into action on hearing that Pedro Banos was to be appointed director of the national security department. The papers detail how the Integrity Initiative alerted “key influencers” around Europe who launched an online campaign against the politician. In the wake of the leaks, which also detail Government grant applications, the Foreign Office have been forced to confirm they provided massive funding to the Integrity Initiative. “In financial year 2017-18, the FCO funded the Institute for Statecraft’s Integrity Initiative £296,500. Apparently, the Institute launched the Integrity Initiative in 2015 to “defend democracy against disinformation.” However, the evidence uncovered strongly suggests that it’s rather more of an attempt to defend disinformation against democracy. “It is one of the cardinal rules of British public life that official resources should not be used for party political purposes. So, it is simply outrageous that the clearly mis-named ‘Integrity Initiative’ – funded by the Foreign Office to the tune of £2.25 million over the past two years – has routinely been using its Twitter feed to disseminate personal attacks and smears against the Leader of the Opposition, the Labour Party and Labour officials. “And this cannot be dismissed as something outside the Government’s control, given the application for funding agreed by the Foreign Office last year stated explicitly that it would be used in part to expand “the impact of the Integrity Initiative website…and Twitter/social media accounts. “It would appear that we have a charity registered in Scotland and overseen by the Office of the Scottish Charity Regulator that is funded by the UK Government and is spewing out political attacks on UK politicians, the Labour Party and the Labour movement. The UK government openly discusses its policy intents regarding ‘behavioural change’, and instituted the Nudge Unit in 2010 to contribute to their behaviourist policy agenda. The behavioural economists from the Unit have contributed significantly to punitive welfare policy, for example. The programme entailing the use of behavioural change science for NATO was delivered by the UK-based Strategic Communication Laboratories (SCL Defence), which has worked for the UK Ministry of Defence and the United States’ Department of Defense for a number of years and is the world’s only company licensed to deliver the Behavioural Dynamics process, and a team of Information Warfare experts drawn from seven nations, called IOTA-Global. “It’s extraordinary that the Foreign Office would be funding a Scottish charity to counter Russian propaganda which ends up attacking Her Majesty’s opposition and soft-pedalling far-right politicians in the Ukraine. “It’s about exploiting existing phenomenon like nationalism and then using it to manipulate people at the margins. To have so much data in the hands of a bunch of international plutocrats to do with it what they will is absolutely chilling. Mass surveillance, data profiling, psychographic profiling and behavioural modification strategies are embedded in the corporate sector and are now very clearly being used in a way that challenges the political canon of liberal democratic societies, where citizens are traditionally defined by principles of self-determination. I’ve spent the past few years writing critically about the neuroliberal turn. The leaked documents show a funding application to the Foreign Office that details the unit’s work. Further papers reveal a unit in Lithuania which received overseas funding to “support a new hub/cluster creation and to educate cluster leaders and key people in Vilnius in infowar techniques”. It’s only over recent years that we are getting a glimpse of new behavioural economics discipline evolving into forms of social control that make the frightful 20th-century totalitarianism regimes seem like a primitive and crude method of governance by comparison. This all-pervasive control is elegant and hidden in plain view. It’s a subtle and stealthy form of totalitarianism. 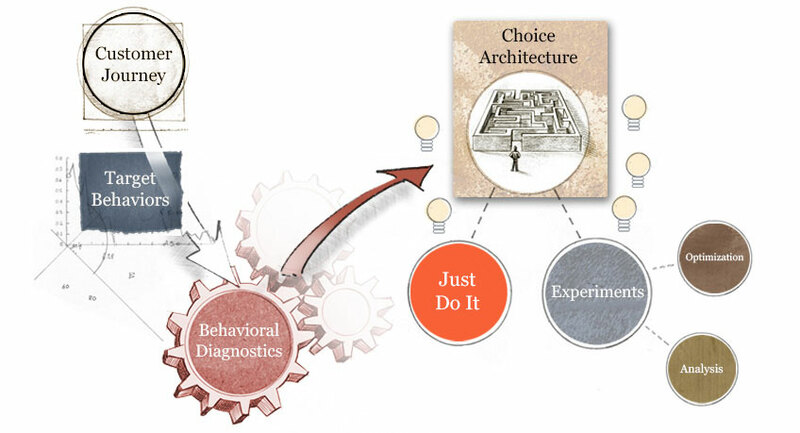 Behavioural science and its various applications as a new “cognitive-military complex” – it originated within intelligence and state security agencies. They work for the government, the energy industry, financial service sector, insurance industry and retail sectors, “helping organisations to embed behavioural economics into their culture”. “The team combines leading academics from the fields of cognitive and social psychology, neuroscience, and marketing with management consulting experts. Our multi-disciplinary expertise allows us to arm our clients with the latest in scientific insights coupled with a strategic business lens”. They also wrote this article among others: How Science Can Help Get Out the Vote. They claim: “Our team of scientists and business experts offers a powerful methodology that analyzes and measurably influences the decisions consumers make”. The consequences of governments acting upon citizens to meet political aims, and to align behaviours with a totalising neoliberal ideology, turns democracy completely on its head. We are left with a form of inverted totalitarianism, or facade democracy, where direct methods of oppression are not required, as citizens are far easier to control and better ‘nudged’ when they continue to believe themselves free and autonomous. This article was originally published on the author’s blog site: Politics and Insights.